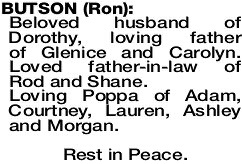 Beloved husband of Dorothy, loving father of Glenice and Carolyn. Loved father-in-law of Rod and Shane. Loving Poppa of Adam, Courtney, Lauren, Ashley and Morgan. 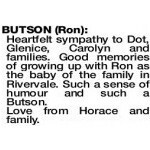 The Funeral Service to celebrate the life of Ron Butson will be held at KARRAKATTA Cemetery on THURSDAY (4.4.2019) commencing at 2.30pm from the main entrance. 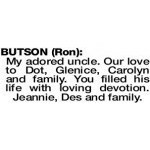 BUTSON RON Heartfelt sympathy to Dot, Glenice, Carolyn and families. 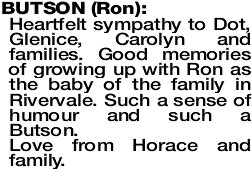 Good memories of growing up with Ron as the baby of the family in Rivervale. Such a sense of humour and such a Butson. Love from Horace and family. My adored uncle. Our love to Dot, Glenice, Carolyn and family. You filled his life with loving devotion. Jeannie, Des and family.